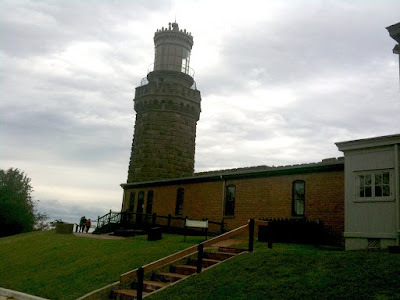 The first picture is a general picture of one of the lighthouse towers of the Twin Lights. One of the towers is actually octagonal while the other is square. In all the times I can remember, only the octagonal one has been open to go up in. But it must've been my lucky day as the square one was open this time. So I basically had to go up and poke around a bit. While it was a bit nippy on the ground with the overcast, it was downright chilly up at the top of the lighthouse. Between that and it closing in a few short minutes, I didn't get to spend too much time poking around. But being another free/educational/fun activity, I couldn't say no! What an awesome blog! I love this! 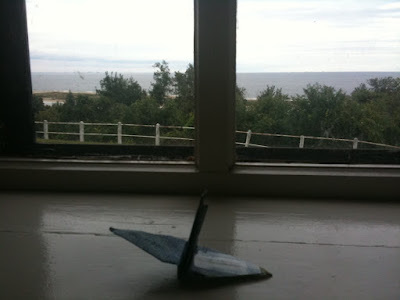 I've heard of the symbolism behind paper cranes but had never really seen it demonstrated like this before.